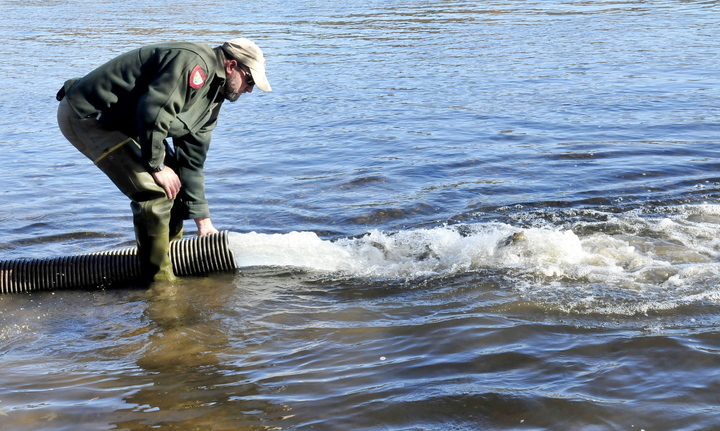 Biologists and anglers look for clues on the decline of fish along the Kennebec River. FAIRFIELD— Biologists are not sure what has caused a decline in the growth of brown trout near the Shawmut Dam, but local anglers, guides and others say it is hurting the local economy. When the Department of Inland Fisheries and Wildlife recently launched a two-year study looking at the reasons for the Kennebec River’s decline, it was the first time in almost 15 years that the fishery has been studied. In the meantime, an area that was once a nationally known brown trout fishery has declined sharply and become seemingly forgotten. Fishing regulations and seasons vary by county, season and body of water. There are also different licensing requirements and regulations for anglers based on age and whether they are Maine residents. In general, regulations are designed to give protection to both stocked and wild fish, encouraging maximum growth rates and ensuring good catch rates and harvest opportunities. They include bag limits, the number of fish that are legally allowed to be killed and taken, and minimum-length requirements. General law for brown trout in Maine includes a 14-inch minimum legal length and a two-fish bag limit, although the law varies by location. At Shawmut, there is a 16-inch, one-fish bag limit on brown trout. Open-water fishing is allowed year-round with artificial lures only. According to the Maine Department of Inland Fisheries and Wildlife, tackle regulations are applied to reduce mortality in released fish and are often a necessary companion to restrictive bag and length limits. In Maine, residents under the age of 16 and nonresidents under age 12 do not need fishing licenses to fish or transport fish taken from inland waters. The state also gives free licenses to any residents who are blind, members of specified American Indian tribes, or war veterans who have certain disabilities; and it has designated free fishing days during the year for families. In 2014, free fishing days are scheduled for Feb. 15 and 16. For a complete list of fishing regulations and licensing requirements, visit the website of the Maine Department of Inland Fisheries and Wildlife at www.maine.gov/ifw/. – Information courtesy of the Maine Department of Inland Fisheries and Wildlife. Staff photo by David Leaming FREEDOM: Fish culturist Scott Davis watches as hundreds of brown trout are released into the Kennebec River below the Shawmut dam on Oct. 29. 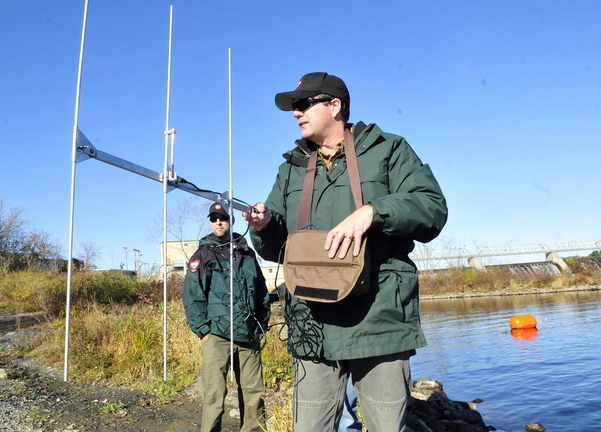 Staff photo by David Leaming FISH STALKER: Department of Inland Fisheries and Wildlife biologist Jason Seiders uses portable radio telemetry equipment to monitor tagged brown trout that were released in the Kennebec River below the Shawmut dam on Oct. 29. A two-year study is underway to determine why trout are not surviving and growing in the area. 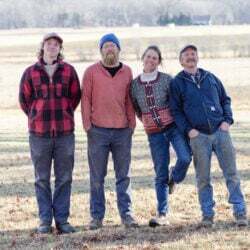 Staff photo by David Leaming FISH DECLINE: Bob Mallard, owner of Kennebec River Outfitters in Madison, speaks recently about the decline in trout fishing on the nearby Kennebec River and the negative impact on his business. Staff photo by David Leaming BIG OL’ FISH: Fish culturist Chad Ridlon holds a tagged brown trout that was released into the Kennebec River below the Shawmut dam on Oct. 29. An antenna can be seen below the fish at right that will allow biologists to record behavior of the fish in an attempt to understand why the fish are not surviving in the water. 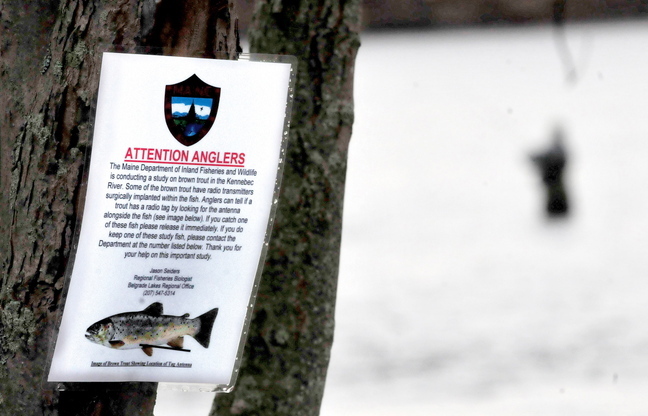 Staff photo by David Leaming SOMETHING IS FISHY: A sign posted below the Shawmut dam informs anglers that a study is underway for brown trout populations and urges fishermen to release tagged fish stocked by the Inland Fisheries and Wildlife department. A fisherman tries his luck downstream in the Kennebec River. About 25 of the 2,000 brown trout released into the river last month have been tagged and will be tracked by the department during the next two years to discover information about their habitat, survival rates and feeding habits. While biologists released the newly tagged fish, a local angler watched in hope of gaining insight into the decline of a once-popular fishing spot. John Dubois, 41, has lived in Shawmut Village for about 10 years. One of the reasons he moved there was to have great fishing in his backyard. He remembers days when he would see dozens of cars parked at the river with license plates from all over the country. Today, he said, he’s lucky if he sees one or two neighbors at the spot. “The fish just don’t seem to be growing like they used to. The quality has gone down,” said Dubois, adding that he once caught a 22-inch brown trout at Shawmut. This year he hasn’t caught a rainbow or brown trout bigger than 16 inches, the minimum length required to keep fish at that section of the river. Dubois isn’t the only one who has noticed the decline. From Shawmut all the way up to The Forks, anglers and guides are saying that the fishing is not what it once was, and that is hurting the economy. According to the most recent data from the U.S. Department of Fish and Wildlife, fishing-related expenditures in Maine totaled $372 million in 2011. In comparison, hunting generated about $202 million in economic activity, according to the department. The condition of Maine’s fisheries affects the number of people who visit the area, as well as the fly-fishing industry, including the number of guides and tackle shops the river can support, said Chris Russell, 48. He has guided on the river for 25 years and does that now for Kennebec River Angler in Caratunk. 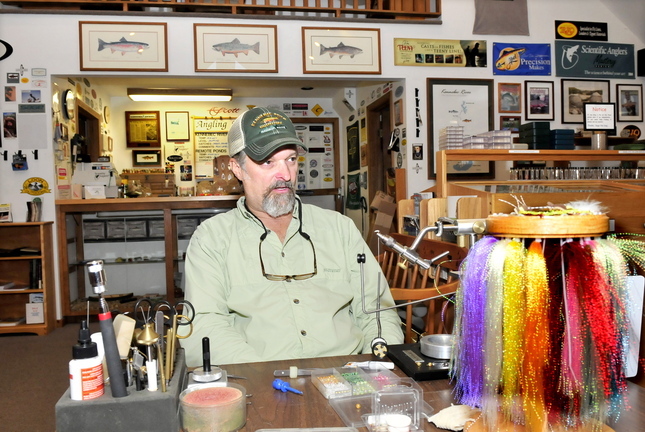 Downstream at Kennebec River Outfitters in Madison, Bob Mallard operates one of only two tackle shops on the river. Located just five miles from the Kennebec, he said business is not what it used to be, and he is trying to sell the shop. The Kennebec, which drains Maine’s second-largest river system, is 170 miles long, originating at Moosehead Lake and traveling to the Gulf of Maine at Bath. 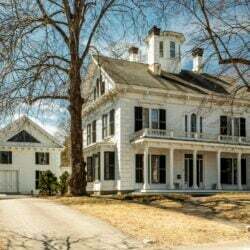 The 40-mile stretch from The Forks to Shawmut, a riverside village within the town of Fairfield, was one of the best places to fish in the state and had national renown, according to George Smith, former executive director of the Sportsman’s Alliance of Maine. “There’s a few spots you can do well, and that’s where you’ll see everybody fishing. The river itself is not even contributing a fraction of what it could to Maine’s economy,” Smith said. Shawmut in particular had a highly successful brown trout fishery in the 1980s and ’90s and was popular among guides, tourists and local anglers, according to Mike Holt, owner of Fly Fishing Only, a tackle shop that closed in April 2011. According to Holt, who said he closed the shop because he was ready to retire and not because of the decline of the fisheries, the proximity of his shop and the fishery to Interstate 95 helped make it successful, bringing people into local bakeries and restaurants. “When Shawmut died, we got a lot less traffic from people who came just about every night to go fish there,” said Holt, 65. The fishery is below the Shawmut Dam in a wide, shallow stretch of river where fisherman can wade almost to the middle on both sides, depending on conditions. “They like to wade, get right out there in the middle of the river. Most of the people that would come here, they would tie their own flies, make their own rods, really old-school fishermen. That older generation, you don’t see that generation come down here anymore. It’s too bad,” Dubois said. Biologists are not sure what has caused the brown trout’s decline, although it is certain that they are getting smaller and more scarce. At Shawmut, catch rates for brown trout were exceptional up until 1999, when they began a dramatic decline, according to the department. In 1993 it took about five hours to catch a legal-size brown trout. In 2008 it took more than 100 hours, according to the department. The data reflect what local anglers and guides are seeing and experiencing, said Sean McCormick, president of the Kennebec Valley chapter of the Maine Council of Trout Unlimited. The council is part of a national organization called Trout Unlimited, which works to maintain coldwater fisheries and protect them from environmental and other threats. An independent guide on the Kennebec for about the last 15 years, McCormick said it was not uncommon to catch six or eight 20-inch brown trout in a single evening when Shawmut was at its peak in the 1990s. This year he did not fish the area at all. Instead, he has been guiding farther up the river, in the Solon and Bingham areas, he said. He thinks other guides are doing the same. 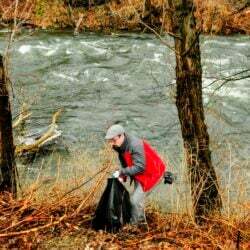 The river’s past success may be linked to the current decline, said McCormick, who also encourages anglers to participate in the department’s efforts to collect fishing data from them. “It did so well for so long we became complacent about keeping data — something that also falls on the anglers. When it did crash, it took everyone by surprise,” McCormick said. The department also has shown that brown trout are not living as long. Between 1995 and 1996, a range of fish up to six years of age existed, with the largest percentage caught being five years old, according to the department. The same study performed in 2013 resulted in only 2- and 3-year-old fish being caught. Theories about the decline include from competition, stocking rates, genetics and water temperature and levels. The department has said it has no explanation yet for the decline. “Given the dramatic collapse that we’ve had there, we think it’s something we need to address. We need to try and figure out what happened and why, and if there are implications for other areas where we have similar problems,” said Jason Seiders, chief regional biologist for the Belgrade Lakes region at the Department of Inland Fisheries and Wildlife. The region is one of seven in the state and includes 300 lakes and ponds and 3,500 miles of rivers and streams, for which there are three biologists, Seiders said. In addition to various sections of the Kennebec River, the Androscoggin River also has experienced a decline in its brown trout fisheries, he said. Studies of the river usually are motivated by the need for relicensing of hydroelectric dams, which occurs about every 30 years, Seiders said. There was a study of the Forks area in 1998-1999 and of the Bingham area in 2001, Seiders said. The department is working on studies on the Shawmut and Solon areas, he said. 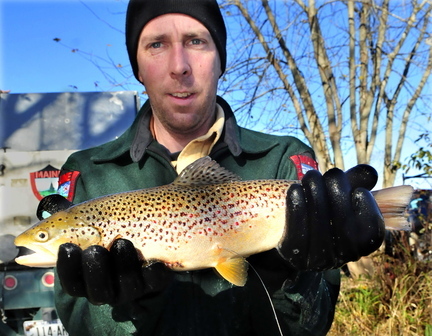 Since 1994, the department primarily has used a strain of brown trout called New Gloucester brown trout in its stocking program on the Kennebec. Thousands of dollars are invested into the stocking program, which is an important part of the work the department does, Seiders said. “Fishing is something people enjoy and that they tell us is a priority. They want to have those fish to catch,” he said. So far in 2013, the state has spent $68,999 on stocking in the Kennebec, according to Todd Langevin, superintendent of hatcheries. Since 1999, concerns about the genetic diversity of the New Gloucester brown trout strain used by the department have circulated among anglers and scientists. At that time, a study that the department contracted to the University of Montana stated that New Gloucester brown trout have low levels of genetic variation, which scientists expected to adversely affect the development of the fish including growth and survival rates. The New Gloucester fish still are used in stocking programs today, although recently two additional strains of brown trout have been introduced that the department says have higher genetic diversity and more wild characteristics. Relicensing for Shawmut is scheduled for 2018, but Seiders said the department wanted to get an early start on research because of the section’s history and the reputation it had as a brown trout fishery. Mallard said he no longer sends his guides, whom he pays $300 per day of guiding, to the Kennebec, where some of the money eventually would enter the local economy. Customers, who are almost exclusively from out of the area, no longer are spending money on lodging and restaurants, he said. Most guides practice catch-and-release fishing, so there is no apparent reason why they aren’t seeing big fish, said Russell, who is on the river every day. “We’d certainly like to see this become a faster fix, a way to speed up the process in getting our fishery back up and going instead of spending time doing small studies. I think all of us have been hoping it would happen a little faster than it has,” he said.